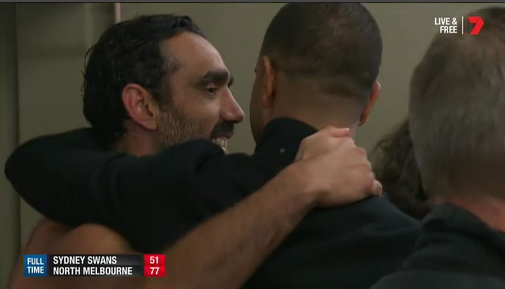 In sport news just in, Adam Goodes, 35, has announced his retirement from AFL. It came after the team he plays for, Sydney Swans, suffered a loss to North Melbourne at ANZ Stadium. The dual Brownlow Medallist told his teammates of his decision following the Swans' 26-point semi-final loss to North Melbourne. He will finish as Sydney's all-time games leader on 372, making him eighth on the competition's all-time list, he kicked 2.2 and tallied 18 disposals and 10 marks in his last game.